Ageing rockers Queen have announced they have rearranged their UK concert appearance this summer after the shock cancellation of Sonisphere meant their headline spot had also been cancelled. 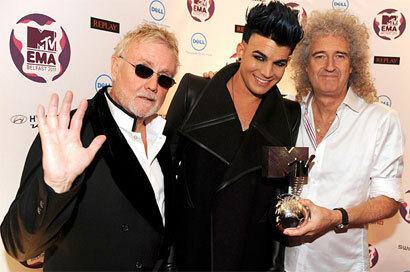 The band, who perform with two out of the three remaining members Roger Taylor and Brian May, will also be performing with flamboyant American Idol contestant Adam Lambert. The highly anticipated pairing will now take place at London's HMV Hammersmith Apollo over two nights, July 11 and 12 2012. Tickets will go on sale next week and the band will give priority bookings to those who held tickets for their Knebworth concert with general sale being on the 18th April. Returning to the historic venue in Hammersmith really appealed to the band, Brian May enthused, “Somehow this feels right - The Odeon is a big part of our history, and its atmosphere is second to none. It's the perfect place to acknowledge our faithful fans, and will be a fitting return to our roots!" Roger Taylor adds: "We had made up our minds to play in the UK this year, so play we will ! Following the collapse of the Sonisphere organisation we didn't want to let down all those people expecting to see us live!" Tickets will be available from Ticketmaster on the 18th April.